Google's highly-anticipated response to Facebook Instant Articles was announced today, and there's something missing. 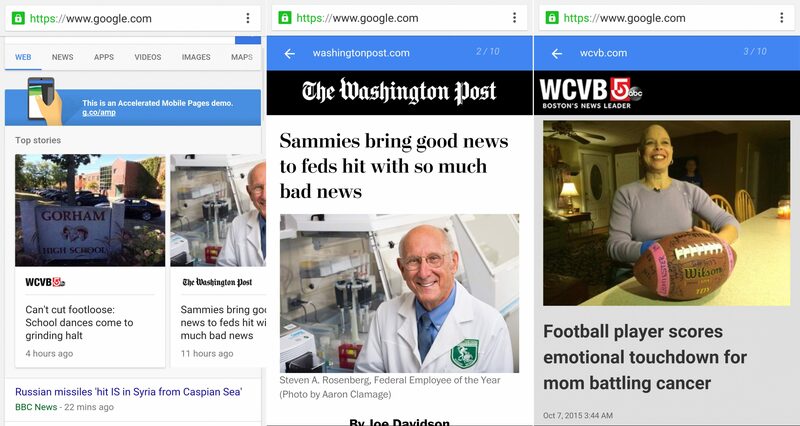 The WSJ, Android Police, Digiday, 9to5Google and a bunch of other sites are reporting that Google held a press event this morning to announce a new tech called Accelerated Mobile Pages. AMP isn't a new app like Apple News, or a distribution channel like Facebook Instant Articles. Instead it's tech that web publishers might one day be able to integrate into their sites so they can improve your mobile browsing experience. According to Google's blog post, AMP is a new open framework built entirely out of existing web technologies, which allows websites to build light-weight webpages. It simplifies the HTML code for mobile Web content so that speed is prioritized over other functions. It also integrates caching tech that would show readers the latest updates of developing stories instead of older versions. Google said it would make its cloud service available for AMP caching. AMP is launching today with 30 partner sites, and Google has said that Twitter, Pinterest, WordPress.com, Chartbeat, Parse.ly, Adobe Analytics, and LinkedIn have already signed up to participate. You can read more about it on Google's blog post, and you can also find the code on GitHub. And if you'd like to try AMP, Google has (theoretically) made a demo available through Google search. I describe it as being theoretically available because I still haven't seen it yet on any of my mobile devices. I also haven't seen it on my non-mobile devices, which to me is the more important issue. While it's great that Google is doing something about the mobile browsing experience, I think they've overlooked the fact that half of all web browsing is not on mobile devices. The non-mobile browsing experience isn't too great either (this is why so many of us use black adverts and tracking scripts) and it could really benefit from any tricks to streamline pages and reduce loading time. Sure, all the blame for bloated webpages falls on web publishers, but a lot of us are actively trying to fix the problem. We'd love to get another tool which could improve the browsing experience on our sites. Don’t you think that the main reason for Google to roll this out is to block adblockers? The way I read it, the pages are composed ‘in the cloud’, and pushed to the handset. That way there’s no easy way for a client-side adblocker to selectively remove the annoying parts. That could be it, yes. I’ve asked a couple tech experts, and they said no. But, in all seriousness, why not? If the pages are being pre-composed in the cloud, how could a client-side ad-blocker work? Or have I misunderstood how it works? The pages aren’t pre-composed in the cloud any more than regular webpages. This is just a unique way to make the pages so that they load faster. OK. That makes more sense. I was under the impression that everything was precomposed and cached by Google. It looks like they are indeed being cached, but maybe not composed. I still worry about ad-blocking, though. If everything is cached by googles servers it will be more difficult for a client-side adblocker to tell ads from content.